Today I finally hit the big 3-0 .. in pregnant weeks. As my friend keeps saying to me, as soon as you get to the 30 mark you are most certainly on the countdown to the finish line, while also feeling pretty comfortable and confident that heaven forbid, if anything should happen and you go into early labour, the risks of preterm labour problems are very limited and your baby is at much better odds of everything being hunky dory. To my credit, I actually used a filter, and a cropper to give it white edges and a nice glow (seriously, check that artificial glow out! ), thinking I was all tech savvy until my very own mother pointed out (very publicly might I add), that I was wearing what appeared to be old black knickers (they were/are in fact purple, thank you very much), and were so old and granny like they had elastic bits hanging off them. On further observation I conceded she was right, and thought – what happened to glamorous me? I might not have ever been one to wear make up regularly or take numerous selfies, but in my hast to show off my baby bump I am ever so proud of, I just put a very public photo of myself hanging out in my grundies, for the world to see. And when it takes your mother, who spends her time in blundstones, boys singlets and paint spattered grey shorts with holes in them to point that out – well let’s just say I’m off to KMART tonight to buy something that at least has working elastic. And maybe repost the entire thing. 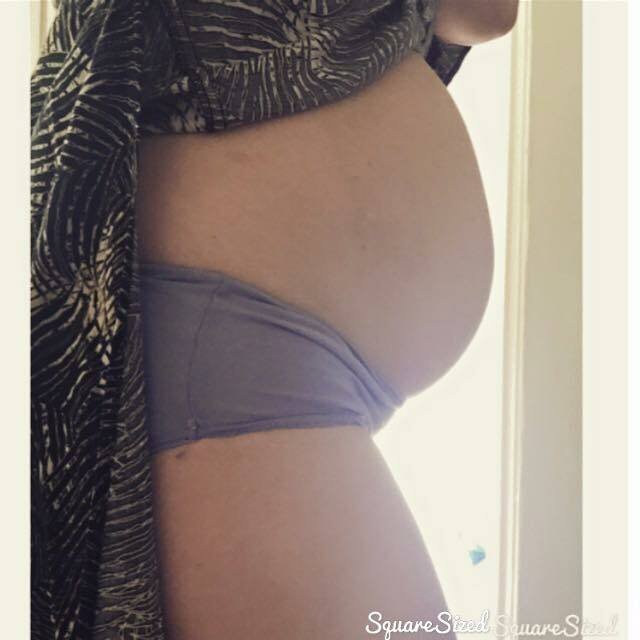 Have you posted some not so glamorous photos of your pregnancy? Coffee + babies – do they mix?